When you refer your friends to Kick It Out, we will give you a special gift. Your referrals are the biggest compliment we can receive and we certainly appreciate them. Exciting Details! The New friend being referred must register, attend classes for the entire season to receive your KIO! Referral Credit of $5 per student. Referral credit will be applied towards last month tuition of the season. 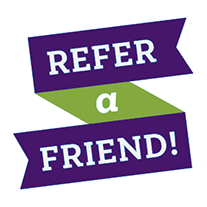 There is a limit of 6 student referrals per season for up to $30 off your last month tuition of the season! Come check out Kick It Out Dance! Team Reach helps us stay organized! KIO welcomed my son and has challenged him in ways I have not seen. The instructors work well with him and the other dancers accept him. I would gladly recommend KIO to anyone and am proud to be a part of this studio. Very welcoming. The staff and dancers are all very friendly and helpful. We have been here 3 years now and I love how relaxed the environment it, how supportive of the dancers, and that everyone is able to participate! The director is always available if you have questions or concerns and has worked really hard with my girls (both younger) to improve their dancing and their self confidence!